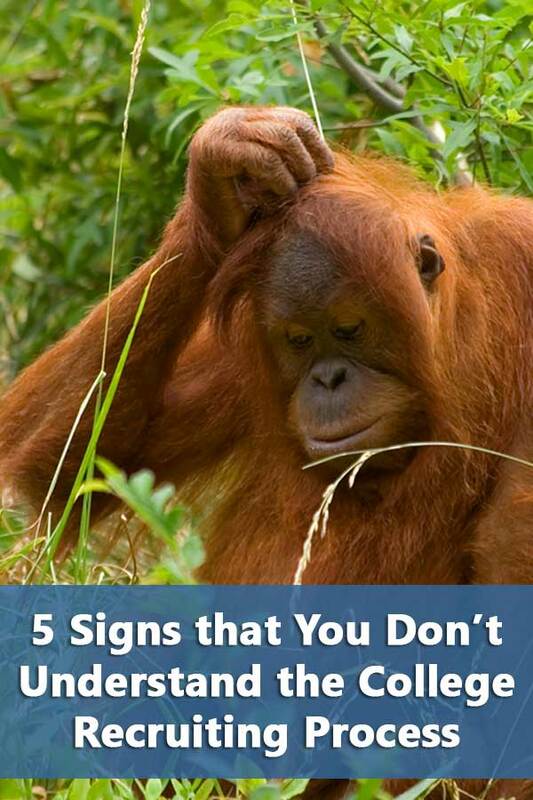 If you spend any time on the internet or reading books on college athletic recruiting, you’ll see lists of common mistakes made by families during the recruiting process. 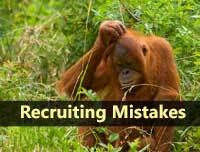 The interesting thing is that there isn’t a lot of variation in the mistakes mentioned, it appears that people are making the same recruiting mistakes over and over. You have to wonder since there are warnings about them everywhere. So I’m about to make my contribution to the list. However, after reviewing a lot of other people’s lists of recruiting mistakes (I am not claiming any new revelations here), I’ve decided to organize them into three categories: ability, process, and finances. Virtually all of the recruiting mistakes people talk about come from families not understanding these categories as they apply to college recruiting. This week I’m going to focus on the recruiting process. 1. You think a letter means you’re being recruited so you don’t have to worry. Depends on the letter. This is one of the classic recruiting mistakes. Pay attention, is it an invitation to participate in a showcase or camp so that your skills can be evaluated, and oh by the way, we don’t accept checks? This isn’t recruitment, this is a sales pitch to attend the camp. But you’ll be recruited at the camp, right? Not if you haven’t contacted the coaches beforehand and know that you can play at the appropriate level. What about the letter asking for you to submit your profile–doesn’t that mean you’re being recruited? No, it means that you are one of probably 1,000 potential recruits that the coach has identified. Maybe she got your name from a camp or the NCAA eligibility center. At this point, coaches are looking for more information to decide if you are someone worth their recruiting efforts. Now smart players will make the letter the start of the recruiting process but this requires knowing that they are actually a good match for the school. 2. You think that you’re good enough so the coaches to find you. Are you ranked as one of the top 100 high school athletes in your sport in the nation? if the answer is no, then thinking you’re good enough for the coaches to find you will most likely lead to disappointment. Maybe the coaches in your region will have an eye on you because of your athletic accomplishments but that’s a pretty shallow pool if you stop to think about it. Let’s think. I’m not even going to address ability here, that will be for next week. Let’s just talk numbers. How many colleges are there within a 200 mile radius of where you play-maybe 30 if you include all divisions? So pick just one division since obviously coaches from all three divisions are not going to recruit you. Shall we say ten schools in the area might have heard about you? How many openings are available on each team? How many are there for your position? What do you think the chances are that there are more than ten college coaches in the relevant division having followed your high school exploits in the local media? Go ahead and up the number to 20, how many of them will be interested in you at your position for their team? Surely there must be other players within 200 miles of you that share your qualifications-what’s your competition? You want to be recruited–you’ve got to let coaches know. 3. You think that your high school coach will get you recruited. Maybe, if you’re lucky enough to have a dedicated coach with the time and resources to get you recruited. But it really is a matter of luck. The coaches responsibility is not to get her players recruited but to coach teams, and in most cases, to win more games than lose. Getting you a college scholarship isn’t really going to help out the situation. Furthermore, not many coaches have the time to develop contacts with college coaches at all levels, much less outside their immediate region. He may be helpful to get you the attention of coaches he knows but that’s not necessarily the best option for you. If the coach offers himself as a resource, by all means, ask for help. But counting on the coach to take the initiative and act in your best interests is a risky business. 4. You don’t start thinking about recruiting until your junior year. Haven’t you heard? There are college coaches with verbal commitments from eighth graders. I’m not saying this is a good idea, I’m saying this is what is happening in some sports while other sports aren’t far behind them. You need to understand the general recruiting timeline for your sport and your level. D1 is always going to be earlier than the other divisions since they have the biggest scholarships and most high-profile playing opportunities for athletes. And because they’re D1 schools, that means that there are some pretty strict rules about when and how coaches can contact players. Think a coach lost interest just because he stopped calling every week? It could just be a “dead period” time in the calendar. The earlier you learn the rules and the lay of the land, the more opportunities you will have. 5. You look at too few schools. Have you been paying attention to some of the numbers I’ve been throwing around? I talk about coaches sending out a 1,000 letters to recruit for less than ten positions. I’ve suggested that being on the radar screen of just 20 area coaches is probably not good enough to ensure that you’re going to be recruited. Just looking at ten schools is a recipe for disappointment. where the coach simply isn’t interested in you. This is a funnel situation. A lot goes in at the top, only a few come out. If you want to have the opportunity to actually choose the school that’s the best match for you, you’ve got to start with a big list–50 is not unreasonable.